Przędzalnia Restaurant offers exquisite cuisine, which harmoniously combines tradition with modernity. The menu has been prepared on the basis of top quality seasonal products. In order to meet the needs of all guests, the Restaurant has prepared special vegetarian and gluten-free dishes, as well as a special menu for our youngest clients. Przędzalnia Restaurant is a unique place where factory interiors combine over a century of history with modern design. The industrial entourage will provide an extraordinary atmosphere during company dinners or occasional parties. We encourage you to study the menu prepared by our Head Chef Wiesław Bober. This short but comprehensive menu will satisfy the expectations of even the most demanding Guests, offering European cuisine with a strong influence of traditional Polish flavours. We would like to wish you amazing culinary experiences. A diffrent option is available every day. For details, pelase ask the waiting staff. 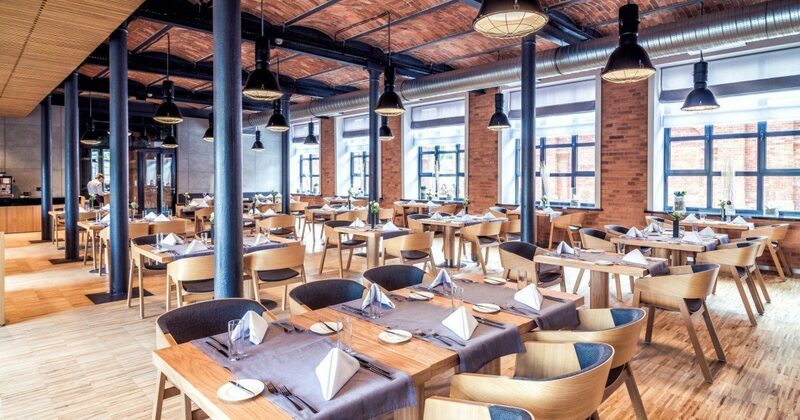 The values of the dishes are emphasised by the post-industrial interiors of the Przędzalnia Restaurant, where over a century of history has been combined with modern design. The Restaurant is open not only to hotel guests, but also to other people who seek unforgettable taste experiences and a perfect place for a pleasant afternoon or evening.